When FIU graduate student John Cibotti finishes a long day, he sets up his custom-built hookah for a smoking session at home. The 29-year-old, whose studies focus on South Asian religion and Middle Eastern studies, has evolved into a hookah aficionado with his expensive equipment and nightly routine. Flavored tobacco for hookah (aka waterpipe) comes with a similar amount of nicotine as the tobacco found in cigarettes, and with that, a dependence on the substance. It also carries dramatically higher levels of carbon monoxide and smoke exposure. 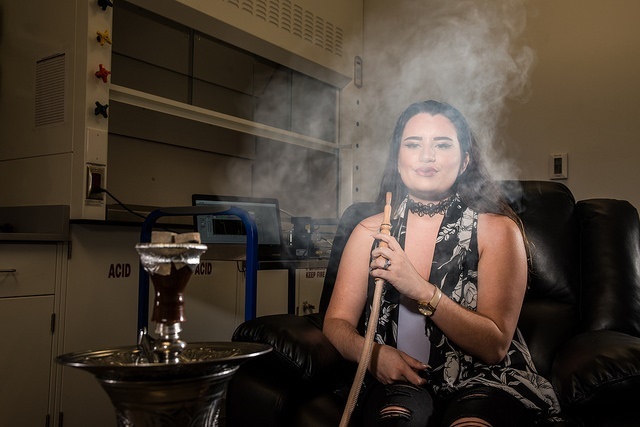 To take a deeper look at the dangers and assess the impact that hookah tobacco has on smokers, the Department of Epidemiology at FIU’s Robert Stempel College of Public Health and Social Work recently unveiled the first clinical research laboratory for tobacco smoking in South Florida. The Stempel College research team— Dr. Wasim Maziak (principal investigator), Dr. Ziyad Ben Taleb (project director) and Dr. Mayra Vargas-Rivera (lab manager)—are the first to evaluate this highly addictive and misunderstood tobacco use method in a clinical lab setting, as its popularity grows statewide and nationally—especially among youth. 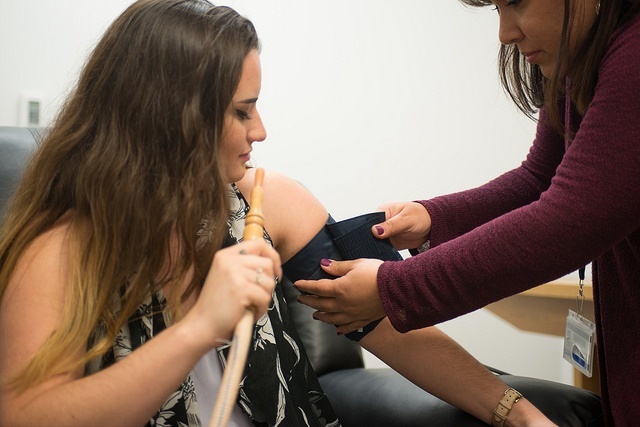 Supported through 2019 by the National Institute on Drug Abuse (NIDA) and the Federal Drug Administration (FDA), the team’s cutting-edge smoking lab is serving as a model for expanded research capabilities at FIU to investigate novel methods for tobacco use and the effects on smokers. The on-campus lab is fully equipped with five computer stations, real-time monitoring equipment for vital signs and the latest technology for smoking topography (i.e., puff count, puff volume, average flow, puff duration and interpuff interval). It has a reception area and an isolated smoking room with the comforts of a living room/hookah lounge to mirror the participants’ real-life experiences. Like Cibotti, 22-year-old FIU graduate Paulina Bollat doesn’t smoke cigarettes, but she smokes flavored tobacco at home in the evenings. When she started at 17, she smoked hookah socially at hookah bars before moving on to using her own waterpipe. The research looks at beginners as well as experienced hookah smokers like Cibotti and Bollat, to measure the effects of flavored hookah tobacco on satisfaction, dependence, harm perception, exposure to toxicants (nicotine, carbon monoxide), as well as on smoking behavior (puffing patterns). Ultimately, they’re trying to understand flavor-related harm perception, addiction and toxicants exposure because hookah users (as well as the public) see hookah as a less harmful alternative to cigarette smoking. The team believes that flavor has a lot to do with a smoker’s satisfaction, exposures, and harm perception, thus their research will inform regulatory agencies like the FDA about the expected effect of flavor regulation on hookah smokers and potential smokers. According to Tobacco Free Florida’s 2014 Florida Youth Tobacco Survey, more than six percent of middle school students and 22.5 percent of high school students reported ever smoking hookah. The state’s prevalence rates have increased by 127.6 percent among middle school students and by 66.7 percent among high school students since the annual survey launched in 2008, yet public awareness lags behind. Maybe it’s because I’m an “older” alum, but did everybody forget that inhaling tobacco via any medium was determined to be extremely unhealthy – a proven carcinogen – in the Surgeon General’s Report of 1964. Further established via hundreds of long term scientific studies since then. It’s an individuals option to smoke anything, provided that choice does not force others to join them. There are so many worthy subjects in need of research funding. Why this one?